Could you live on it? That question came up when we happened to find a bill from 1937. 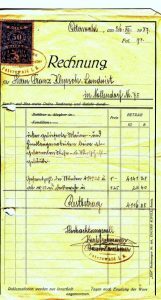 This bill amounted to 4141 hours á 1 Kc = 4,141.00 Kc, for masonry and stooges carried out during the reconstruction of my grandfather’s burnt-down residential and commercial building; exhibited by master builder Karl Grohmann from Peterswald . The bill is still duly provided with the necessary stamp. 4141 working hours á 1 Kc, equal for masons and henchmen. This low pay, can that be possible? In 1933 1 kg of bread cost 1.60 Kc, beef 10 to 12 Kc / kg, flour 2,80 Kc / kg, sugar 2,80 Kc / kg, 1 herring 0,55 Kc / piece and a pair of crackers 50- 60 brighter. It is hard to believe that prices changed significantly four years later. At that time, there was not a 40-hour working week, more like 10 hours a day and then earning just 10 kroner, so that could still feed the family, was that possible? How bad must the time have been !? Although in the village most families in their house had the opportunity to keep some small cattle, had a small field for a few potatoes and could therefore probably feed a pig. Still, did that meager income bring life to life? At that time I was still a child and can hardly remember the money. For our dad I sometimes had to fetch 10 “zora”, which were the cheapest cigarettes, for 1 crown. 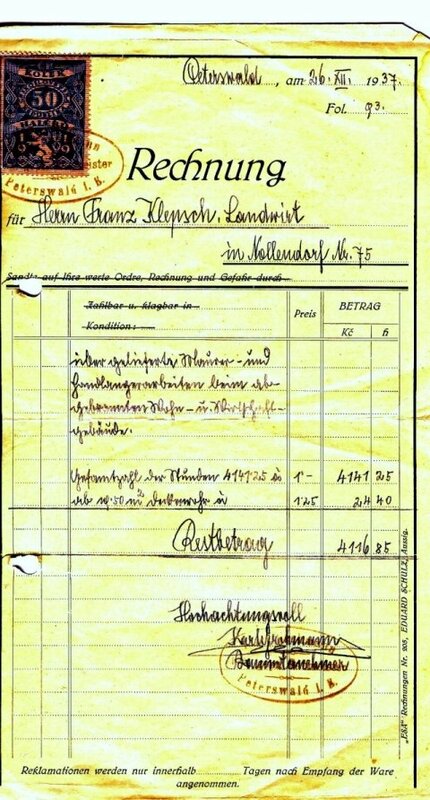 Occasionally, there were 20 Heller for an errand, but I implemented it in a few “Stollwerkln” by return mail. Better than the money I can remember the fire with the grandparents. It was on a Saturday in early July. The last load of hay had been brought in the afternoon. Grandfather had already gone to sleep, Uncle Otto had gone to the village for a glass of beer and cut his hair. The grandmother with Aunt Rola were still busy in the kitchen and still had the Sunday cake in the tube when the neighbor’s daughter knocked on the window with a scream: “It burns with you”. 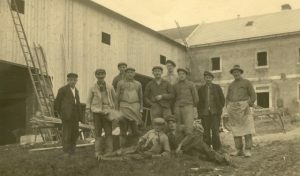 She was on the way home from Hinter-Tellnitz at about 10 pm , had only heard a bit of smoke at first, but when she arrived at the “Alte Buche” she saw the fire coming out of the barn. How would she like to be running about 300 m? The cause of the fire has never been clarified. Self-ignition of the hay could be excluded due to the good harvest weather. Possible sparks flying from the chimney to the thatched roof of the utility building? Also possible that tramps had made themselves comfortable in the hay and carelessly handled a cigarette? Arson? excluded, there was no enmity or envy. I came to myself that night when Mama shook me awake and told me to get up and get dressed. The provision was not unfounded, because the distance to the fire was not the greatest. Now I realized that hell was going on outside. Firelight lit up the night sky, I heard loud human voices, animals roaring and heard an incessant back and forth. Years later, when I read Schiller’s bell, the fire night was so impressively before my eyes again. Only, Nollendorf was not a medieval town, the houses were fortunately some distance from each other, but the wind that brings any fire and the many thatched roofs that were there was enough danger. You also have to imagine that there was no telephone or electric light in the village. The “fire alarm” was then the ” Streit-Franz“He hurried through the town with the foghorn when fire was reported. At that time, the fire brigade still had a horse-drawn hand pump syringe and 3 ponds, but hardly larger than a bathtub. There was no water pipe. To extinguish a fire under these circumstances was a utopia anyway. But by seeing the mountain court far inland, some motorized weirs came from there. Despite this intense support, everything burned down to the ground. Eternit’s dwelling house and thatch-covered barn with stables fell victim to the fire. A big thank you was there to the neighbors and other helpers, because except for a few pigs, all livestock could be saved. Even the household effects and some of the agricultural equipment were not a robbery of the flames. Everything was rebuilt that same autumn, but it was not the old house with its cozy corners anymore. Everywhere there was a smell of fresh brickwork and I missed very much the old floor chamber into which I liked to crawl. There were stored whole years of old magazines and calendars, various dishes and things that the great-grandfather, when he had made long journeys as a hop trader, brought along. Then there was no small familiar window on which the grandmother would put a white cloth if she wanted to call the people working on the field, whether it was a cow calving or something unusual had happened. Everything, once upon a time. The house is still standing today and probably serves as a holiday and weekend home. Where are all the neighbors who helped so impressively and selflessly back then? One was always dependent on each other, just a grown community. That we were all so torn and scattered is and remains a crime.